The Big Wobble: Lightning from cloudless skies, prolonged heatwave and strong winds turn British Colombia into a giant inferno over the weekend! Lightning from cloudless skies, prolonged heatwave and strong winds turn British Colombia into a giant inferno over the weekend! Thousands of people in B.C. are being affected by new evacuation alerts Sunday as more than 200 wildfires continue to burn across the province. On Sunday, the B.C. Wildfire Service said 97 new fires started on Sunday - bringing the provincial total to 230 as of 8:45 a.m. PT. Chief information officer Kevin Skrepnek said, other than that, he was unaware of any major changes to fires overnight. Many communities forced to evacuate are in the Interior and Cariboo regions, from Ashcroft, Cache Creek, Princeton and the 100 Mile House area. 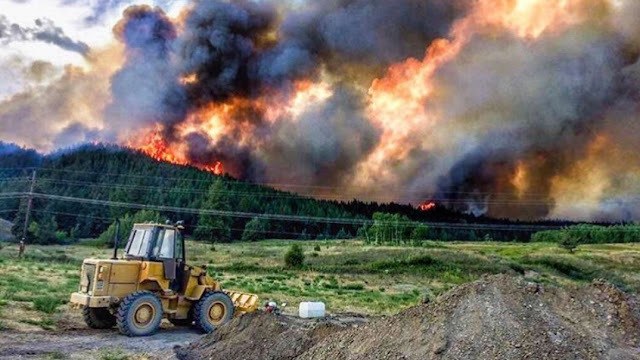 On Saturday night, the communities of Scottie Creek and Hihium Lake (around 60 kilometres from Cache Creek), as well as Alexis Creek (around 114 kilometres west of Williams Lake) were also ordered to evacuate. Those orders affect more than 600 people, adding to the more than 7,000 who left their homes earlier in the weekend. The province also announced Saturday night that Wells Gray Provincial Park would be closed as a precaution until further notice. The B.C. Wildfire Service and BC Parks said anyone currently within park grounds needs to leave the area immediately. Officials will be restricting access to the park as of 8:00 a.m. PT. Around a dozen wildfires of concern were listed Sunday morning, burning through more than 15,500 hectares of land and and threatening buildings in the Interior and Cariboo. The B.C. Wildfire Service said hot and dry weather across most of the province in recent weeks set the stage for wildfires, but there were other unexpected factors that caused problems too. "What we didn't see coming was the extent of wind we had yesterday ... and also a significant amount of dry lightning," said chief fire information officer Kevin Skrepnek. Temperatures in the Interior are expected to stay above 30 C through the weekend and it will be much the same in the Cariboo. Lightning and high winds are expected to continue. Nearly 2,000 B.C. firefighters battled fires across the province Saturday. John Rustad, B.C. 's minister of forests, lands and natural resources operations, said 260 firefighters from across Canada are due to arrive in the province early this week. Saskatchewan Premier Brad Wall said his province was sending three aircraft and 30 firefighters. Police as well as search and rescue teams from the Vancouver area are headed to the region to help, and B.C. Public Safety Minister Mike Morris said the military may be called in. The Canadian Red Cross is accepting donations to provide financial assistance, family reunification services, as well as cots and bedding for those forced out of their homes. A state of emergency remains in effect for all of B.C., giving the government special authority to respond to the fires. There hasn't been such a state province-wide since 2,500 fires broke out in the summer of 2003. More than 140 new fires broke out across B.C. on Friday alone. Many were caused by lightning, but the wildfire service said a good number were also sparked by people. Officials said Saturday some of the most serious fires were expected to get worse before they get better. One of the biggest fires is burning near the village of Ashcroft, about 120 kilometres west of Kamloops. As of Saturday night, that blaze was estimated at 4,200 hectares in size. Another wildfire near Princeton is estimated to be around 1,500 hectares in size, having grown 10-fold over the course of a day.